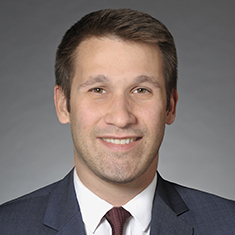 Louis A. Laski is an associate in the Trusts and Estates group, where he represents ultra-high-net-worth individuals with their estate planning and administration needs. Louis designs and assists in the administration of a wide variety of estate planning transactions—from basic "core" estate planning documents, such as wills and revocable trusts, to much more complex and specialized transactions, including sophisticated trusts and gifting strategies. Having a tax background, Louis is especially well-equipped to deal with complex gift, estate and generation-skipping transfer tax issues, as well as the intersection between transfer taxes and income taxes. Louis' proposed estate planning transactions often harmonize (to the extent possible) all of the applicable taxing compilations, but never lose sight of the client's goals. Additionally, Louis enjoys assisting non-profit and tax-exempt entities in forming effective tax-exempt organizations and maintaining tax-exempt status under applicable federal and state laws. Louis also enjoys working with entrepreneurs, not only from a transfer tax perspective, but also to assist in developing strategies and helping achieve growth. Shown below is a selection of Louis’s engagements.